We are not going to beat around the bush on this one, clowns are scary, serial killer clowns are especially scary, we are scared. Good. Now that we have addressed the giant, scary elephant in the room, let’s get down to business, to defeat the clowns – oh wait, wrong description, our bad we are still a little shaken. Okay, back to the description, hmm, yes, this is a clown mask, a mask that looks a lot like a clown, it can be worn on your face to make you look like a clown (without having to actually commit to the scars), you will look like a murderous clown in this mask, you are not wrong. Okay, we are a lot shaken, this mask… definitely gets the job done! 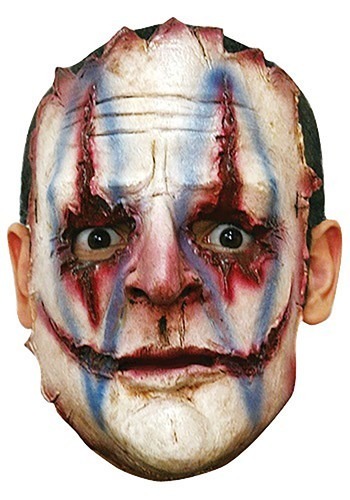 This is a latex mask, colored with white, red, and blue faux face paint, and completed with red scars around the eyes and the mouth. It will cover your face, and secure in the back with an elastic band. Once this mask is on, you will most likely scare yourself in the mirror at least once, probably more, stay strong, it will be okay. While this mask is terrifying, it truly is worth it to see the looks on other people’s faces as you walk up to them to ask for candy!